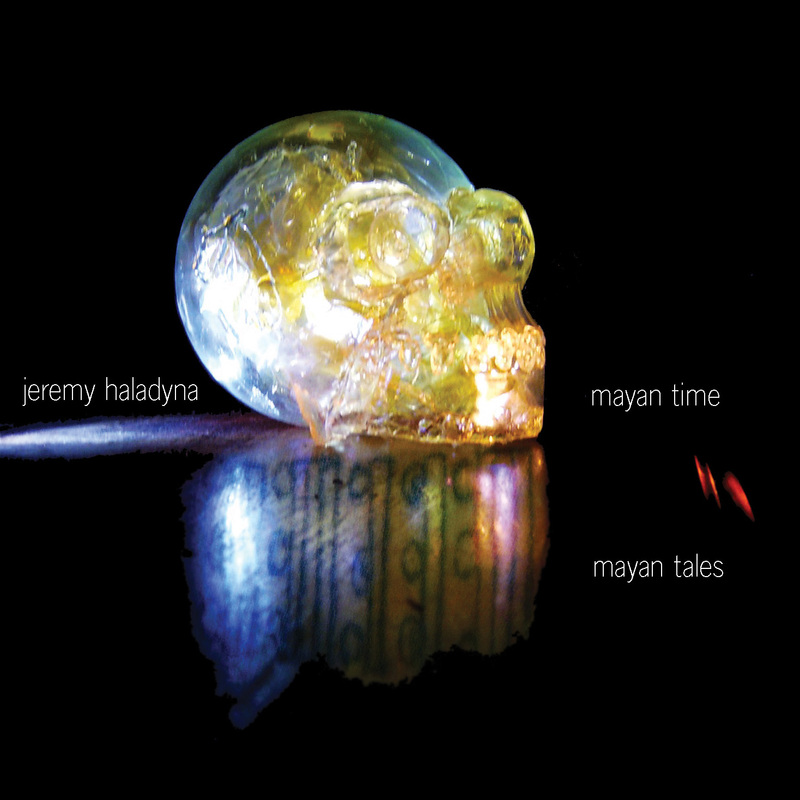 The best way to really LISTEN to the end of the Mayan Great Cycle is with this new innova release by Jeremy Haladyna: Mayan Time/Mayan Tales. On more than a third of this disk, sound bears direct witness to the Maya and their calendars—Mayan notions of time reborn as scales. And atop the scales, tales: of a crystal skull, a fearsome temptress, a still-living bird that saw Creation, and a princess who gave her soul to marimba music. Microtonalism comes to archaeology. Here is a 2nd innova release exploring the peculiarly magical works of Santa Barbara-based Jeremy Haladyna, who in more than 25 years and nine visits to the Mayan region, has ventured ever more deeply into the mystery of Maya culture, resulting in his unique collection, THE MAYAN CYCLE. Cast here in sound is the most famous of the crystal skulls, right alongside more human faces…those of three important women of Maya lore and legend. The Princess of the 9 Cave (tracks 1-3) hearkens to the legend of a Mayan princess who died deep in a cave in Guatemala hiding from the conqueror Alvarado. In the collective mindset of the Quiche, her soul takes up new residence in the tree used to make marimbas. And so she speaks through all marimba music, emerging liberated from her cave, at the end of track three. That moment of supreme royal sacrifice is joined to Haladyna’s new “2012 scale,” which marks a yet more pivotal moment. In this new scale, outermost boundary notes represent (exactly, in mathematical terms) August 11, 3114 BC—when the Mayan calendar began, and December 21, 2012, when the current Great Cycle ends. And so, inside the cave with the Princess, we “hear” the Great Cycle reverberate microtonally for the first time. And who are those other Maya women? On the raunchier end there is Xtaj [Lust Woman], whom Mayanist Dennis Tedlock relates directly to the La Llorona [Weeping Woman] figure so feared through all of Latin America. This work for piano with inside effects, ceramics and processing is meant to frighten, since in the Quiche Maya world Xtaj stalks and kills young men. Xunaan Balam [Jaguar Woman], is likewise invoked in her own track, but now on an occasion of great joy. As Jaguar Woman musters all the winds around her in sanctification of fruitful ground, she is a powerful witness to the fusion the Maya have made of their native heritage with Catholic tradition. Add this new disk to innova 754, Haladyna’s Selections from the Mayan Cycle, and you have a digest of all of his newly-invented Mayan calendar scales. His most signal achievement, these scales go a long way towards reflecting in sound a Mayan philosophy of time. And time and music are in-separable! Performers on this disk include L.A. freelance oboist Michele Forrest, young L.A. vocal sensation Allison Bernal, at home in both pop and contemporary classical settings, duo percussionists Anthony Paul Garcia and Marjan Riazi, and Jeremy Haladyna himself playing piano, processed piano, and pipe organ.